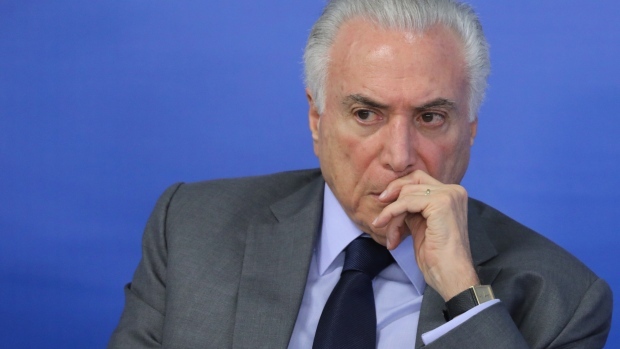 (Bloomberg) -- Brazil’s former President Michel Temer was arrested on Thursday as part of the Carwash corruption probe that’s ensnared some of the country’s top business executives and politicians, local media reported. Brazilian markets slumped. A Rio de Janeiro judge also ordered the arrest of one of Temer’s former ministers and closest aides, Wellington Moreira Franco, according to website G1. The exact motive of the arrest was not immediately disclosed and Temer’s lawyers didn’t immediately respond to a request for comment. The move represents the latest development in the country’s massive Carwash corruption investigation which is now in its fifth year. The investigation started out as a probe into kickbacks involving state-controlled oil company Petroleo Brasileiro SA, known as Petrobras, and later brought down chief executives of major construction firms and led to a jail sentence for another former head of state, Luiz Inacio Lula da Silva. Brazilian markets slumped on the news, with the Ibovespa stock benchmark falling as much as 1.8 percent. The real was the worst performing among major currencies, down 1.2 percent as of 11:51 a.m. local time. Temer along with five others were charged with corruption and money laundering in December. The former president denied any wrongdoing in the case. He is also being investigated for allegedly receiving bribes from JBS owner Joesley Batista. A lifelong politician, Temer assumed the presidency in 2016 after the impeachment of his predecessor, Dilma Rousseff. During his administration, the government passed several market-friendly measures including a bill that limits public spending increases.